Do not hull or wash your fresh strawberries until shortly b efore serving them. For best flavor, serve strawberries at room temperature. 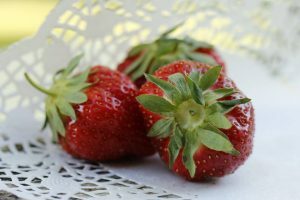 To preserve freshness for about a week, refrigerate strawberries on a lower refrigerator shelf, covered lightly with a paper towel. Strawberries will get soft after being frozen, but they retain all their flavor and nutrition. There are three main ways to freeze strawberries. Choose your method based on how you think your family will use them in the winter. 1.Flash Freezing: For smoothies, ice ring garnishes for punc h, fruit salads or fruit cups, rinse, stem and let your strawberries dry. Spread them out on a cookie sheet and freeze. When frozen, pack them into freezer bags, removing as much air as possible from the bag. 2. 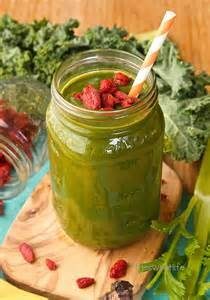 Blended: For making jam later in the winter, or for pre-blended smoothie mix, rinse and stem strawberries, then lightly pulse them in a blender or a food processor. Measure 8 cups blended berries into gallon Ziploc bags. Lay flat and freeze. Break off chunks or use entire bag later to make jam or smoothies. 3. 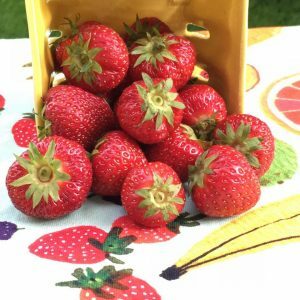 Sliced: For ice cream or yogurt topping, a side dish at dinner, or for use in a muffin recipe, rinse, stem, and slice your strawberries, sprinkle them lightly with sugar, and pack gently into quart Zip-lock bags. Jam Today! 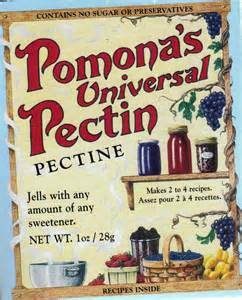 With Pomon a’s Universal Pectin® sold by Brouwer Berries! Pomona’s sugar free, preservative free, low-methoxyl citrus pectin is specially formulated for making low sugar jam & jelly. Sweeten jam & jelly to your taste with low amounts of any sweetener: sugar, honey, agave, maple syrup, frozen juice concentrate, stevia, xylitol, Sucanat, concentrated fruit sweetener, or Splenda and other artificial sweeteners. 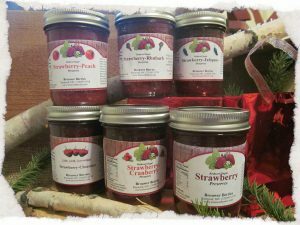 Each 1 oz box makes 2 to 4 batches (about 5 – 8 oz jars per batch). Keeps indefinitely. Method: Place the frozen berries in the blender and let them thaw for about ten minutes, or drop fresh fruit into blender. Add kiwifruit and orange juice and blend on high until smooth. 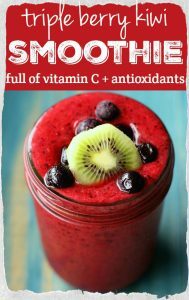 Top with more kiwi or berries if desired. Preparations: Pick Brouwer Berries and freeze them after hulling and washing. A strong blender is needed such as a Nutri Ninja with at least 900 watts of power. I grow kale and freeze it also. Add to blender in this order. Pulse and blend until all ingredients are rotating as seen by funnel at the top. It will be a nice thick smoothie. It serves two and has about 450 calories without the protein powder and 520 calories with the protein powder. Whipped topping or whipped cream for garnish. Add all ingredients to a mixer bowl or food processor, mix until crumbly. Press into a half sheet pan (about 18 x 12). Prick all over with a fork. Add a jello, sugar, cornstarch, salt and Sprite to a saucepan over medium heat. Bring to a boil and whisk until stir thickened. Remove from heat and cool to room temperature. Slice strawberries. Arrange over crust. Pour filling over strawberries Refrigerate 2 hours or until set. Directions: Wash and hull strawberries. 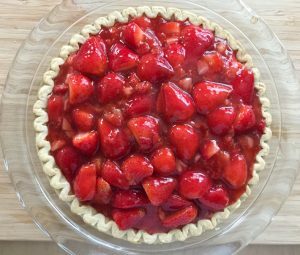 Place about half of the whole strawberries in the baked pie shell. Mash the remaining berries until a fine pulp. If necessary, add a little water to make 1 1/2 cups pulp. Bring pulp to boiling. Gradually stir in a mixture of sugar and cornstarch. Cook over moderate heat, stirring constantly, until mixture thickens and boils. Boil 1 minute (until clear). Cool. Pour over strawberries in pie shell. Chill at least two hours in refrigerator. Serve with ice cream or whipped cream. Enjoy! Preheat oven to 350 degrees. In a mixing bowl, combine crushed pretzels, sugar and melted butter. Press into a lightly greased 9×13 pan. Bake for 8 minutes and remove from oven. Let cool completely. Put all filling ingredients in a large bowl. Beat with electric mixer for 15 minutes. The mixture will be stiff and fluffy. Fold in 8 oz Cool Whip. Spread over cooled crust and freeze. Before serving, add dollop of Cool Whip and fresh strawberry on top. Very refreshing in the hot summer evening! In heavy saucepan, melt butter & chocolate chips over low heat. Cool slightly. In a large bowl, beat eggs & brown sugar. Mix well. Combine baking powder and flour – stir into chocolate mixture. Spread in a greased 9-inch square baking pan. Bake at 350 degrees for 30-35 minutes or toothpick test works. Cool. OPTIONAL – if you don’t feel like baking brownies from scratch, just buy a brownie mix for a 9″ pan and prepare it according to directions. Cool. Melt chocolate chips, cool. In a mixing bowl, beat cream cheese until fluffy; add powdered sugar and jam. Stir in melted chocolate, spread over cooled brownies. Place egg whites in large mixing bowl and let stand to room temperature. sheet in 8 round circles, building each circle up on sides. crusty to the touch.. Cool and remove from paper. Cover with fresh sliced Brouwer strawberries and top with whipped cream. 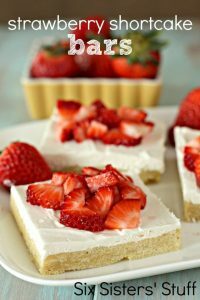 This easy Strawberry Nachos recipe with crispy cinnamon sugar tortilla chips, whipped cream, and juicy strawberries is the most delicious summer dessert! Mix together ½ cup of sugar and the cinnamon. Set aside. Heat vegetable oil in a frying pan over medium heat and fry flour tortillas on both sides until golden. Place the fried tortillas on paper towels and sprinkle both sides with cinnamon sugar. Cut the tortillas into triangles. Chop a couple of triangles into small bits for garnish. Set several small strawberries aside. Cut the rest of the strawberries into small pieces and place them in a bowl. You should have about 1 cup of strawberry pieces. Sprinkle with two tablespoons of granulated sugar and stir. Allow the strawberries to sit for about 10 minutes and then stir again. Keep the cinnamon chips, whipped cream, and strawberries separate until ready to serve. Line a paper berry basketor paper food tray with waxed paper and then fill with cinnamon sugar tortilla chips. Top with whipped cream, sugared strawberry pieces. Sprinkle with cinnamon chip bits and place a few whole strawberries on the top. 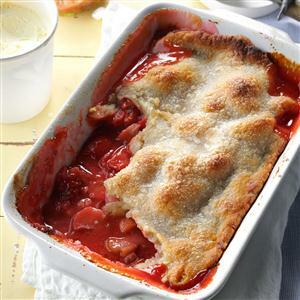 Filling: Place rhubarb, strawberries and lemon juice in2 quart saucepan, cover, cook, stirring occasionally, until tender, abut 8 minutes. Mix sugar and cornstarch in small bowl and stir into mixture. Cook and stir until comes to boil. Boil 1 minute. Remove from heat and add vanilla. Crust: Mix flour, oatmeal, brown sugar, soda, and salt in bowl. Add butter, beat on low speed until crumbly. Reserve 1 1/2 cups mixture. Press remaining mixture in bottom of a greased 9×13 pan. Spread rhubarb mixture over crust; sprinkle with remaining crumb mixture. Bake 30-35 minutes, until golden brown. Topping: Stir powdered sugar, vanilla and milk in small bowl to a drizzle consistency. Drizzle over cooled bars. Cut and serve. Store in refrigerator. Makes 3 dozen bars. or roll into a 14” circle on an ungreased cookie sheet or pizza pan. Bake at 325 degrees F for 15 minutes. Cool. In a bowl combine cream cheese, vanilla, granulated sugar and lemon juice. Spread on cooled crust. and simmer until thick and glossy. Cool. Spread on top of cooled filling. Cut fresh strawberries into slices and place on top of glaze. Serve. Make a graham cracker crust, this works in almost any size pan – depends on how many layers you want to make and how thick you want it to be. I’ve even skipped the crust and layered the fruit and cheese cake in a bowl. Beat together: 1-8oz. pkg. of cream cheese, 1/3 c. sugar, and 1 tsp. vanilla. 1. Preheat oven to 425°. In a large bowl, mix sugar and flour. Add fruit; toss to coat. Transfer to a greased 11×7-in. baking dish. Dot with butter. 2. For crust, in a bowl, mix flour and salt. In another bowl, whisk oil and water; add to flour mixture, stirring with a fork until a dough is formed (dough will be sticky). 3. Roll dough between two pieces of waxed paper into an 11×7-in. rectangle. Remove top piece of waxed paper; invert rectangle over filling. Gently peel off waxed paper. Brush pastry with milk; sprinkle with sugar. 4. Bake 40-50 minutes or until golden brown. If desired, serve with ice cream. Yield: 8 servings. Editor’s Note: If using frozen rhubarb, measure rhubarb while still frozen, then thaw completely. Drain in a colander, but do not press liquid out. In a large bowl, cream butter and sugar until fluffy. Add eggs, one at a time, mixing after each egg. Mix in vanilla. In a separate bowl whisk together flour, salt and baking soda. Add to wet mixture and mix just until combined.Spread on a greased, rimmed baking sheet (I use a 13x18x1″ pan/cookie sheet). The dough will be just like cookie dough- heavy and sticky- so it’s best to spray your hands with a little nonstick spray and use them to help mold the dough into the pan. Bake at 375 degrees for 10-15 min, until light golden brown or until a toothpick comes out clean. Let cool completely. Mix together cream cheese, powdered sugar and vanilla. Beat until smooth, then fold in the Cool Whip and stir well. Spread cream cheese layer over cooled sugar cookie bars. Place in the fridge for about 30 minutes to let the cream layer set up. 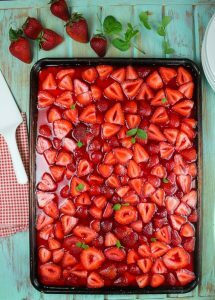 Top with fresh strawberries, cut, and serve. I learned that these look the best if you put the strawberries on right before serving, otherwise the juice from the strawberries can tint your cream layer pink. Store leftovers in the fridge. Makes 40-48 bars (depending on how large you cut them). Lightly spray a 9″ springform pan with non-stick spray; set aside. In the body of a blender or food processor combine graham crackers, sugar, and salt; blend until the crackers have been completely pulsed to crumbs. Add melted butter; stir well to combine. Press down firmly into the prepared 9-inch springform pan; set aside. In the body of a high power blender, food processor, stand mixer fitted with the whisk attachment, or in a large bowl using a hand held mixer, beat the softened cream cheese and sour cream until completely smooth. Add sugar and vanilla; beat until smooth, scraping down the sides and bottom of bowl as needed. Add in the eggs and yolks; beat until smooth. Stir in the flour, mixing just until combined. Quickly stir in the cream, mixing just until it’s incorporated in the batter. Pour filling into prepared crust, and spread evenly. Wrap the bottom of the pan in tin foil (I recommend doing a few diligent layers here; no one wants a wet crust). Place the cheesecake pan into a large, deep pan. Fill the pan up with hot water half way. This is your water bath and will help ensure your cheesecake comes out crack free. Place pan in the oven and cook cheesecake for 1 hour and 25 minutes. Turn oven off and let the cheesecake sit, undisturbed, for 55 minutes inside the oven with the door shut. The cheesecake should be still slightly wiggly. Remove cake from oven, run a knife very gently around the edge of the cake, and let it sit in the pan for 15 more minutes before covering loosely with plastic wrap and refrigerating for at least 6 hours. 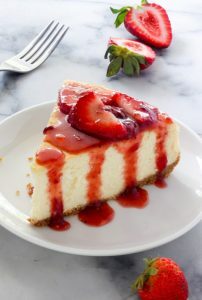 When ready to serve, top with a dollop of whipped cream or fresh strawberry sauce and enjoy! Process 1 1/4 cups of strawberries, sugar and lemon zest in a food processor or blender until smooth. Transfer mixture to a medium-sized bowl, stir in remaining sliced strawberries, and chill for at least 1 hour before serving. 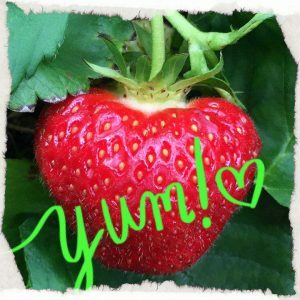 Mission Statement: To grow and sell high quality strawberries while preserving the environment, serving the community and maintaining family values.